Welcome to SAGE, the Social Alterations Google Earth module! Each station along the SAGE module represents a small window into the vast, diverse and interdisciplinary world of conventional global apparel supply chains by introducing learners (educators and independent learners alike) to an edited sampling of resources, including classroom-ready learning activities (worksheets, study guides, lesson plans, etc.). Through SAGE, we’ve sought to harnesses interdisciplinary resources and facilitate responsible learning to strengthen industry capacity for research in responsible apparel. Each key station comes equipped with placecards (so you’ll know where you are! ), photos, videos, resources and learning activities – use the legend to guide you! The SAGE Module was developed by Mary Hanlon, Nadira Lamrad and Maughan Pearce, with a big thank you to the team at Google Earth Outreach for their training and support. Ready to get started? Happy learning, friends! WAIT! Not sure how Google Earth works? 1. If you’re new to Google Earth and you’re really not sure, click here: How do I use Google Earth? 4. If you’d prefer not to use Google Earth to retrieve these resources, just select the stations from the left-hand rail. 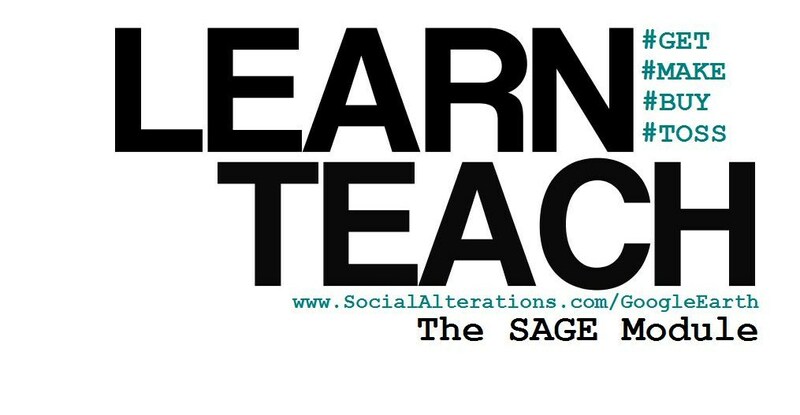 SAGE, a Learning Resource by Mary Hanlon, Nadira Lamrad and Maughan Pearce, for Social Alterations, is licensed under a Creative CommonsAttribution-NonCommercial-ShareAlike 3.0 Unported License. This entry was posted in Curricula, Responsibility, Social Alterations, Social Alterations - Curricula on June 9, 2012 by Mary Hanlon.